2 COMPLETE PRACTICE EXAMS - 60 questions each, formatted exactly like the actual API™ 28 exam (with the same number of exam questions) to give you a "real exam" feel. 99% SUCCESS RATE - we have helped thousands of students pass their API™ exams. In that time, only a few students have failed. The API™ 28 exam is a 90-minute exam consisting of 55 multiple choice questions broken up into two sections, part A and part B. Part A: Concept questions – The first section of the exam will be approximately 44 concept questions. These questions will test your understanding of definition or topic. The multiple-choice answers will generally provide 2 or 3 partially correct answers and one “best” answer. Part B: Case questions – The second section of the exam will be approximately 11 case questions. These questions will require you to apply your knowledge to a specific scenario or event. You will be given a real life scenario; your job will be to select the best recommendation to solve the given scenario. 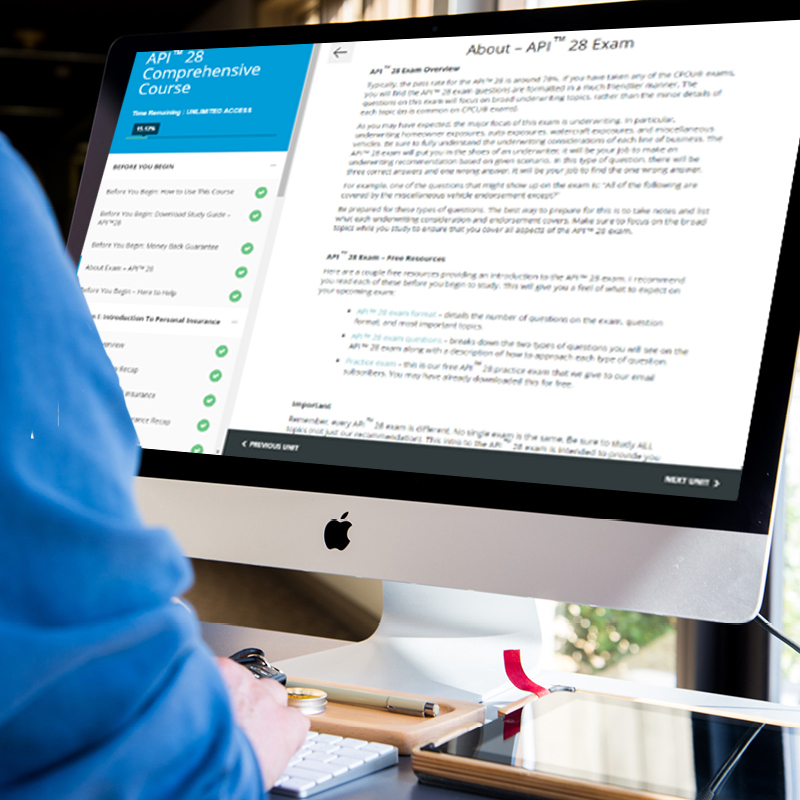 For more info about what to expect on the exam, see our blog about the API™ 28 Exam Overview. 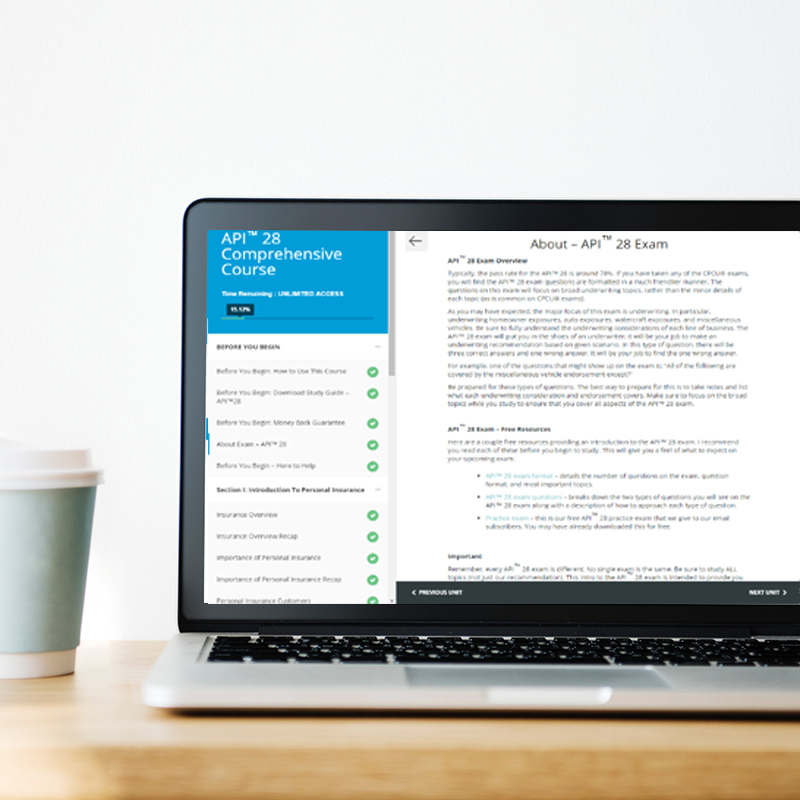 The API™ 28 exam questions are tough, these questions focus on the minor details and differences of the underwriting process and personal insurance product. It is extremely important that you memorize all of the underwriting techniques and details for each type of personal insurance product. This is the hardest part of the API™ 28 exam. For more insight, see our blog about the API™ 28 Difficulty. The API™ 28 exam covers the topics of personal insurance underwriting and marketing including underwriting for auto, homeowners, miscellaneous vehicles, umbrella, watercraft, and inland marine. As you may have expected, a major focus of this exam is underwriting, in particular underwriting the homeowner’s policy, automobile, watercraft, and miscellaneous vehicles. Be sure to fully understand the underwriting considerations of each line of business. 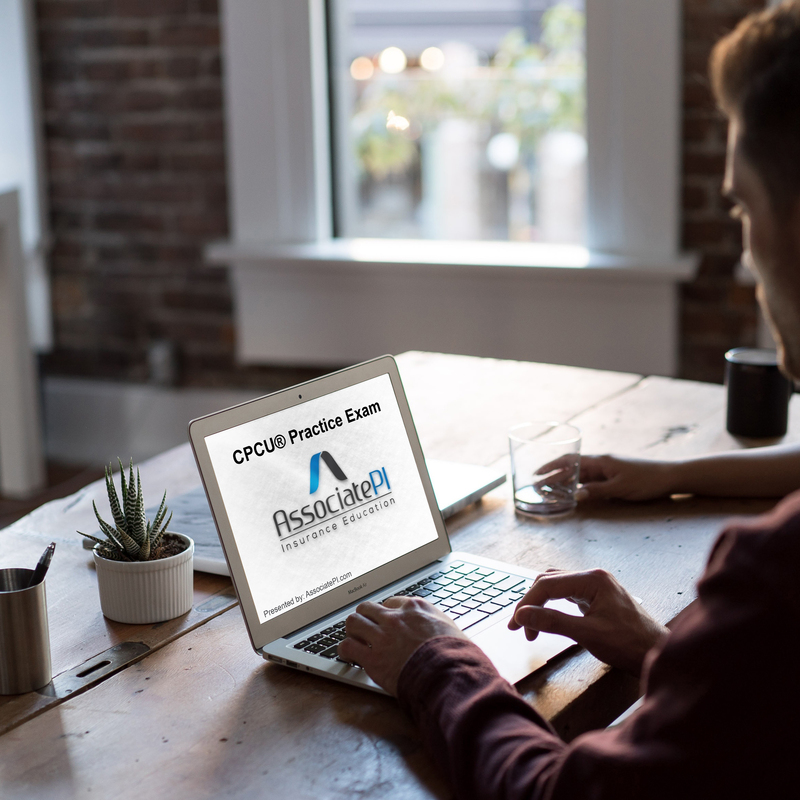 The API™ 28 exam will put you in the shoes of an underwriter, it will be your job to make an underwriting recommendation based on given scenario. Below we are outlining some important API™ 28 exam topics. We recommend you master these topics before attempting the API™ 28 exam. This is our opinion of the topics that are important on your exam. Personal insurance marketing – focus on the topics of underwriter marketing roles, distribution systems, and distribution channels. Underwriting introduction – focus on the topics of loss exposures and loss hazards. Personal auto policy – focus on the topics of liability underwriting considerations and physical damage underwriting considerations. Homeowner underwriting – focus on the topics of property underwriting, property loss exposures, and homeowner liability. Miscellaneous auto – focus on the types of automobile, auto coverages, and underwriting considerations of the automobile. Watercraft – focus on the coverage options for watercrafts (Small boat, yacht policies, etc) and the underwriting considerations of a watercraft and watercraft operator. For more info about the most important topics see our blog about the API™ 28 Exam Topics. 3) Practice, practice, practice. Take as many practice exam and quizzes as you possibly can. This will help you familiarize yourself with the API™ question format and help you determine which topics you need to re-study. Once you go through a few practice quizzes and exams, return to your notes from step 2 and review any section that you failed to comprehend on the practice exam. For more information about the type of questions you will see on the exam see our blog about the API™ 28 Exam Questions. Remember, every API™ exam is different. No single exam is the same. Be sure to study ALL topics (not just our recommendation). This resource is intended to provide you with a general idea of where your focus should be. Make sure to thoroughly study every topic of this exam. API™ exams are administered by the American Institute for Chartered Property Casualty Underwriters (“The Institutes”). AssociatePI does not administer the actual exams, we are an independent resource of free content, advice, and study material for professional insurance education. This blog is intended for informational purposes only, to inform prospective students of the benefit of the API™ designation.